(1) As for the public messes, the Cretans call them andreia, but the Lacedaemonians phitidia, either because they are conducive to friendship [philia] and friendliness, or because they accustom men to simplicity and thrift, for which their word is pheidô. But it is quite possible, as some say, that the first letter of the word phitidia has been added to it, making phitidia out of editia, which refers merely to meals and eating. (2) They met in companies of fifteen, a few more or less, and each one of the mess-mates contributed monthly a bushel [medimnos] of barley-meal, eight gallons of wine, five pounds [mnai] of cheese, two and a half pounds of cheese, two and a half pounds of figs, and in addition to this, a very small sum of money for such relishes as flesh and fish. Besides this, whenever any one made a sacrifice of first fruits or brought home game from the hunt, he sent a portion to his mess. For whenever any one was made late by a sacrifice or the chase, he was allowed to dine at home, but the rest had to be at the mess. (3) For a long time this custom of eating at common mess-tables was rigidly observed. For instance, when King Agis, on returning from an expedition in which he had been victorious over the Athenians, wished to dine at home with his wife, and sent for his rations, the Polemarchs refused to send them to him; and when on the following day his anger led him to omit the customary sacrifice, they laid a fine on him. 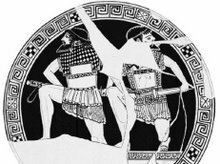 (4) Boys also used to come to these public messes, as if they were attending schools of sobriety; there they would listen to political discussions and see instructive models of free behavior [eleutheria]. There they themselves also became accustomed to sport and jest without scurrility, and to endure jesting without displeasure. Indeed, it seems to have been especially characteristic of a Spartan to endure jesting; but if anyone could not bear up under it, he had only to ask it, and the jester ceased. As each one came in, the eldest of the company pointed to the door and said to him, "Through that door no word goes forth outside." (5) And they say that a candidate for membership in one of these messes underwent the following ordeal. Each of the mess-mates took in his hand a bit of soft bread, and when a servant came along with a bowl upon his head, then they cast it into this without a word, like a ballot, leaving it just as it was if he approved of the candidate, but if he disapproved, squeezing it tight in his hand first. (6) For the flattened piece of bread had the force of a perforated, or negative, ballot. And if one such is found in the bowl, the candidate is not admitted to the mess, because they wish all its members to be congenial. The candidate thus rejected is said to have been 'kaddished' [kekaddisthai], for kaddichos is the name of the bowl into which they cast the pieces of bread. (7) Of their dishes, the black broth [zomos] is held in the highest esteem, so that the elderly men do not even ask for a bit of meat, but leave it for the young men, while they themselves have the broth poured out for their meals. And it is said that one of the kings of Pontos actually bought a Spartan cook for the sake of having this broth, and then, when he tasted it, disliked it; whereupon the cook said, 'O King, those who relish this broth must first have bathed in the River Eurotas.' After drinking moderately, they go off home without a torch; for they are not allowed to walk with a light, either on this or any other occasion, that they may accustom themselves to marching boldly and without fear in the darkness of night. Such, then, is the fashion of their common messes. "Battles were long, men can't push that long." The crowd cannot do anything fast. As soon as it starts to advance it begins to lose cohesion. Once this occurs it cannot transfer force through the ranks effectively. That is not to say "pushing" stops, but by my definition, the type of pushing done by the first few ranks with not transfer of force from deep in the file is not true "othismos", but the same shield bashing and pushing seen in a clash of any group of close-in fighters such as during Roman battles. For the most part in the Crowd-Othismos men are simply standing and leaning. It is exhausting, perhaps moreso mentally than physically, but no more than active weapons duelling. The phalanx does not advance like a steam roller, but like a ratchet, with perdiodic loosening and tightening of the ranks. When a rapid advance does occur, like it must have as one side gave way, it was only the front ranks pushing and even they were doing more "herding" like we see with riot police and crowds, than pushing in the sense of othismos. An advance in true othismos can only occur through shuffling steps until one side gives way. As they begin to rout, they reduce the pressure on their foes that the othismos-crowd requires. "Men can't fight and push"
When authors envisioned men bent over like rugby scrummers I could understand this objection. In the Crowd-Othismos, men are standing upright, and but for the extreme close range, their right arms are free to do whatever they wish with them. Obviously at this range you cannot use your dory against the man ahead of you, but the dory is some 8' long, not an Iklwa. It could not be used at any range approaching shield on shield contact. Swords, broken spears, fists, foot-stomps/hooks and teeth would be the order of the day. "Twelve ranks of Spartans could not resist 50 ranks of Thebans for more than a few moments and yet we know that this phase of battle lasted for some time, with the Spartans even gaining ground to pick up their fallen King." Not a problem when we understand that coordination of the crowds movements is what adds force in the othismos. There is only so much coordination you can get out of a file of 50 men. Even with a deep phalanx you probably can't get much more than 8-12 ranks perfectly coordinated. Thus, each side produces a forward thrust of about the same size at any given moment. As we wrote above, the depth acts like a wall behind your back. If you are pushed back, it forces all your ranks to tighten and become de facto coordinated to resist being moved. Twelve ranks of Spartans could push back the Thebans, but at a great disadvantage. The figurative "uphill battle" could only end one way. I'll note that my distinction of pushing at different densities, with othimos only occurring at the tightest packed is not something that the Greeks would have made. They only speak of battles coming down to pushing, they did not disect the process and probably did not undertand it any better than a college kid rushing a stage at a rock concert. To them the whole process was one event.